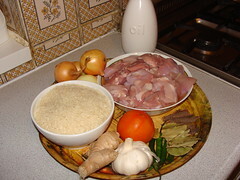 As a follow up to the Mutton curry recipe I posted last week I promised a few friends I’d post up a recipe for making Chicken Pilau Rice with Peas which is often served with Mutton Curry in Pakistani/Kashmiri households. Many of my friends who have been round to my place or mom’s will have eaten this and im hoping they will be able to follow this recipe for themselves ( yes Alan, I mean you! :p ). Pour sunflower oil into a large cooking pot, pour enough oil to cover the base of the pot. Add butter to this, I normally use about a quarter of a small block of unsalted butter. Put the heat on relatively low and melt the butter into the oil. 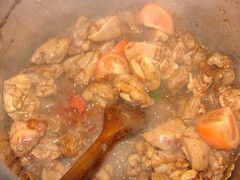 Add the cardomen, cinnamon, bay leaves and cumin to the pot and stir into the oil. Turn the heat up a little but not too high. You want stir these aromatics into the mixture for a couple of minutes. 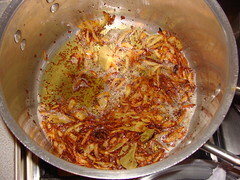 Slice the onions fairly coursely, and add to the pot along with the chillies, grated ginger and the garlic. Stir into the mixture until the onions are golden and crispy, this can take about 5 to 10 minutes, dont be tempted to turn the heat up if you do you’ll end up burning the onions, you want them golden and caramelised – as pictured. Once the onions are done, add the diced chicken to the pot and stir into the mixture, try to make sure that you coat all the chicken evenly with the oil and onions. 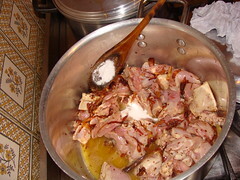 Also at this point add a tablespoon or so of salt, and stir in. You need to keep the chicken moving in the pot so it doesn’t stick to the bottom, but don’t stir it too aggresively, just work it gently until its golden brown. The chicken will also release its own natural liquids so you’ll end up with a lovely golden colored gravy coating the chicken. Again do not turn the heat up high, the trick is to be patient and just let it take as long as it takes. If you try to force it by turning the heat up, it will all go horribly wrong. When the chicken takes on that lovely golden coating and the mixture looks like its reducing nicely, chop your tomato into quarters and add to the pot. As pictured. 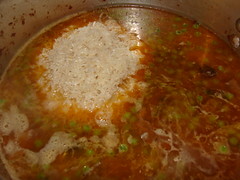 By the time the mixture reduces completely the tomato will have completed dissolved and disappeared. Once it’s reduced add the frozen peas to pot. Because they are frozen they too will shed a some liquid, just stir them in for a couple of minutes. Then you need to add boiling water to the pot. You need to add enough to cover the chicken and peas completely. Allow this simmer gently for about five minutes. Whilst thats simmering you need to wash your rice in cold water. Rice contains lots of starch and you need to wash it out basically until the water runs clear. I do it by placing the rise in a bowl of cold water then rinsing through a collinder, and repeating that until the water is clear. Once the rice is washed add it to the pot and stir in. You then want to cover the pot and place into a hot oven (220 deg C ) for about 45 minutes, and leave it alone. It’s not a bad idea to check on it at around the thirty minute mark if you’re nervous about burning it. Usually 45 minutes is enough. After 45 minutes remove the pot from the oven. The rice should be cooked beautifully, and the aromatics you added early on will have infused the rice so it’ll have the wonderfully pungent spicy aroma. You can serve the rice with the mutton curry. As with the last recipe I have uploaded detailed photos with instructions into a set on flickr. Enjoy! BTW: for all those vegetarians out there, you can substitute the chicken for Chick Peas which also works really well. This entry was posted in Uncategorized by Nadeem. Bookmark the permalink. Do you mean I should stop coding and start cooking! Hi there, when you say cups do you mean the American ‘cup’ or the English drinking cup- I am so making this recipe!!! Found your recipes through google, as I was pondering what to cook one evening. Your chicken pilau rice with peas is wonderful. More please! OMG I need to try and make this!!! I have been dying to make this rice for ages! I hope it tastes as good as it looks on here! Many Thanks Tracey! My first time making this recipe so far so good. But I did alter the recipe by cooking it on the stove until the rice is tender and then covered with foil and put in the oven. Awaiting end result will give you feed back. Love this Pakistani/Kashmiri recipe. Its such a delicious meal and can be eaten regularly. Please do post up more Pakistani/Kashmiri food, as this food needs to be recognised and honoured 🙂 its the real authentic taste of curry and rice! Thanks for sharing.